A last minute schedule change brings two child prodigies to the stage to perform on piano in the sixth and final concert of the Salida Aspen Concert series this Saturday, August 13. The concert is at 7:30 p.m. at Salida High School auditorium, 26 Jones Avenue. A pre-concert discussion with the artists begins at 6:45 p.m. onstage. The concert, originally billed as students from the Aspen studio of Wu Han/David Finckel, instead will showcase the amazing talents of ten-year-old Harmony Zhu and twelve-year-old William Chen. 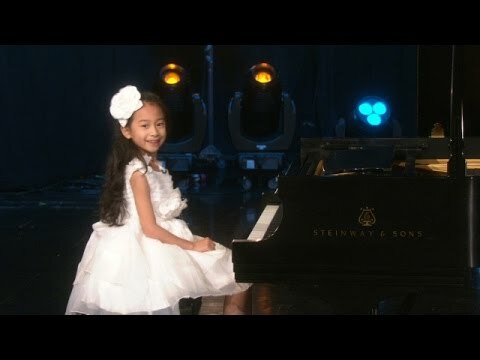 Harmony Zhu was six years old when she won first place in the seven-year-old category of the 2012 Canadian Music Competition, the youngest winner in the history of the prize. In 2014, she was named one of the “30 Hot Canadian Classical Musicians Under 30” and moved to the U.S. to enter Juilliard School as the youngest student there and the youngest in history to win the Juilliard Pre-College Concerto Competition that same year. Check out these videos of Zhu on The Ellen DeGeneres Show, Nov. 3, 2014, and Nov. 17, 2015, . She’s playing with a contraption under her feet so she can reach the pedals. Zhu was seven years old when she gave a recital at New York’s Carnegie Hall and was asked back three times. She was selected to open the international festival, “Passion of Music 2015” also at Carnegie Hall. Recently she won the grand prize at the VI Chopin International Competition in Hartford, Connecticut. Again she was the youngest to win it. She also received a gold medal in the International Music Competition sponsored by American Association for Development of the Gifted and Talented (AADGT). Zhu composes music, is writing a book and plays chess. Her book is about the Middle East where she won the World Youth Chess Championship in 2013 in the United Arab Emirates. She is a North American Champion in chess. William Chen started playing piano at age five. At his first full-length solo recital he played music of Franz Joseph Haydn, Claude Debussy and Frederic Chopin. His debut as guest soloist was with “Le Petit Orchestre” New Jersey. At age ten, he performed the Beethoven piano concerto No. 3 in C minor with the Midwest Young Artists Symphony Orchestra. Chen won first prize in the “Little Mozarts” category of the Young Pianist Competition of New Jersey. He won first prize for those eleven years old and younger at Manhattan School of Music’s Pre-College Division Concerto Competition for all instruments. Chen has also received first prize in Cecilian Young Artist Competition and the gold prize from the competition sponsored by the American Association for the Development of the Gifted and Talented. He won first prize in the Crescendo International Competition with a perfect score of ten. Chen has won numerous prizes for both solo and chamber work. In 2015, he won the Sound Symphony Concerto Competition, first prize in the 17th New York Music Competition for Young Artists, and third prize in the Young Artist Category from V Chopin International Piano Competition in Hartford, Connecticut. Already he has performed in such famed venues as Carnegie Hall, Alice Tully Hall, Lincoln Center, and Holywell Music Room at Oxford University, Great Britain. The concert is underwritten by Elise Backinger and Kent Strickland.